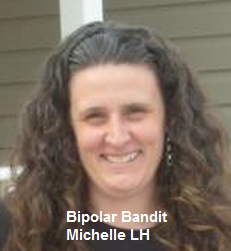 My name is Michelle Clark and I started suffering from severe depression at the age of 13. I would just cry and cry for no reason, could not concentrate or do simplest tasks like vacuuming. I would miss two weeks of school at a time. I had a severe manic episode at the age of 17 that resulted in a hospitalization. It was during the month at the hospital that I was diagnosed with bipolar disorder. I was always a good student and high achiever. After missing two weeks of school, I would make up all my work in 2-3 days. It is now thought that those were mini manic episodes that enabled me to do that. I got mainly A’s in school, was the president of several clubs in high school and graduated from college with a degree in elementary education. I was the manager of a movie theater, a trainer at Walt Disney World, and taught school for about ten years. I was even named Teacher of the Year in 2004. I am not telling you about these accomplishments to brag, but to make you realize that eventhough I had this mental illness, I still was able to achieve a lot. I have been hospitalized more times than I can count. Although most of the time it was for psychiatric reasons, I was also hospitalized several times for ailments that were thought to be caused by the medications I was on for bipolar disorder. I had pancreatitis, my gall bladder removed, numerous stomach problems severe enough for hospitalizations, tardive dyskenisia, heart problems bad enough to put me in icu, and dystonia. The worse being dystonia when my chin was “stuck” to my chest for about four months. I was really lucky that this was not permanent. After being in the hospital for various reasons 16 times in one year, I was forced to stop teaching and go on disability. I have always tried to fight for the rights of the mentally ill. 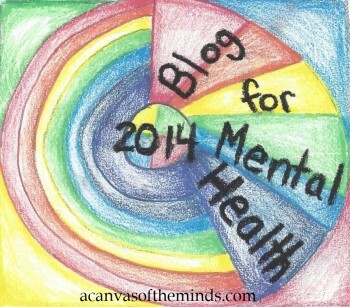 I also am on a mission to fight the stigma of mental illness. I have written numerous letters to politicians trying to change the way those who have mental illnesses are treated. I fight the battle every day. I mainly stay somewhat depressed, but am mostly worried about the manic episodes. I keep fighting the fight although some days it seems hopeless. I have a strong support system, a loving family, and a strong faith, and am determined to rise above this illness. These things help me every day. This entry was posted in Uncategorized and tagged bipolar, bipolar disorder, depression, don't quit, mania, manic depression, stories about bipolar disorder. Bookmark the permalink. Thanks for sharing your story. As a former psychiatric nurse, I know that it helps others battling your disease to hear what others have gone through. I wish you well and congratulate you in drawing attention to this condition and raising awareness for those of us who do not fully comprehend what you and other sufferers go through. Thanks for your encouraging words and for following me on Pinterest. I have bipolar, I think the biggest mistake people make is the medication. The drugs are toxic and turn us into vegetables. If you really want to fight this disease, you must control your environment and stress levels. You must eat a specific healthy diet and partake in physical activity daily. On top of all of that, marijuana has been the only drug I have found in 20 years that really helps, but it must be the right strain or you could set off your BP with marijuana. Kudos Matt. I have bipolar and am on Lithium, Lamictal and Zoloft. I know that I can’t physically ever stop taking them, but I have found a lot of alternative success through exercise, my gluten free diet, marijuana, and limited alcohol consumption. I couldn’t agree with you more!